As a senior, playing on that collegiate field is more than just blood, sweat and tears. Instead it is filled with joy, sadness and preparation for the team to go on after the seniors leave. Caitlin Shaver and Jessica Thornton both experienced these emotions with having to stop playing their favorite sport during their senior year of college. 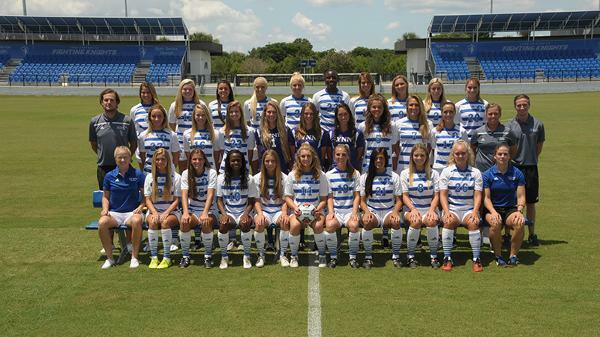 The 2015-16 Women’s Soccer team had to begin their season with 20 new girls as well as the few returning players. “[In] the second game in Georgia we were playing well but hadn’t connected yet, there was a lack of communication and it prevented us from scoring and [left us] giving up the opportunities we had during the game,” said Caitlin Shaver, goal-keeper. As returning players, Shaver and Thornton felt pressure to teach the newcomers how to belong to a collegiate team. “[Our coaches] wanted us to start changing the program because we were going to set the tone in a sense,” said Jessica Thornton, outside back player. Unfortunately for these two seniors, their last year on the field did not end as they hoped. Shaver had experienced an injury to her jaw during the team’s away game at Saint Leo. “It was a breakaway and I went out to get the ball and the girl tripped and her knee went into my jaw,” explained Shaver. After losing one returning player, the team did not think they were about to lose another one. Thornton during practices began to feel weak and even getting sick during the team’s regular practice drills. “I found out that I have a hyperactive thyroid,” said Thornton. Even though these two girls were not playing during their final games as Lynn athletes, the support they received from the team was something they will not forget. “Once I found out, it was heartbreaking to tell the girls that I couldn’t play anymore,” said Thornton. “[The team] still checks up on us to this day and I love the girls,” said Thornton. At the end of the season, the girls were even recognized during senior night to remember the times they both had on the field.